Bees are more than just good pollinators -- they're good recyclers, too. According to a study out of Toronto, some species of bees have taken to reusing humans' plastic waste for constructing their nests. Scott MacIvor discovered that despite an increasing amount of non-degradable materials littering our landscape, bees have managed to adapt to our wastefulness, turning our discarded resources into their own. "Bees are often referred to as declining around human development, but its increasingly clear there are urban winners and losers," MacIvor told The Dodo in an interview. "Some species do well or better around humans than without them." MacIvor studied the bees' building practices by setting up "trap nests" around Toronto, which allowed him to observe not only how bees constructed their brood cells, where solitary bees (like the species MacIvor studied) lay their eggs, but also how effectively plastic building materials protected the bees from other environmental threats, like parasites. 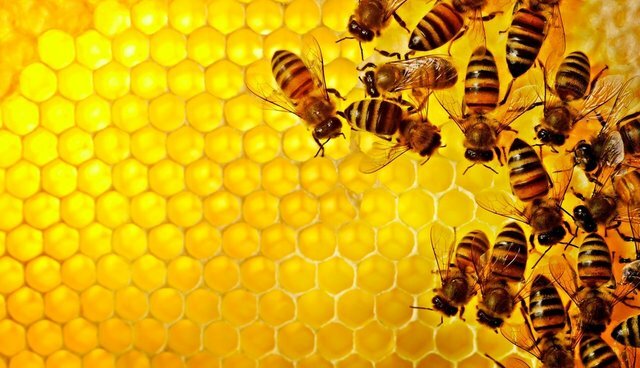 He found that bees incorporated plastic in their brood designs in accordance with the natural material they would ordinarily use, such as leaves. And for the bees who collected plastic bags, MacIvor reported, "all pieces were of the same consistency and presumably from the same source." But the insects didn't merely use plastic as a replacement for the plants they typically use. "A benefit of using alternative nesting materials like plastic would come when the natural nesting material is absent or limited," MavIcor explained. "In cities, it is often thought that nesting materials is the most limiting factor for many bees." That didn't appear to have been an issue for the bees he observed, though. The bees used leaves, too; they just supplemented plant materials with the plastic waste they found. In one nest MacIvor looked at, plastic waste comprised just 23%. He also noticed that where the bees had used plastic instead of leaves, the bite marks on the material varied -- "suggesting," as he writes in his report, "the use of plastic bags represented an aberrant behavior." For the most part, the bee larvae that matured in partially plastic cells emerged healthy, and in one scenario all of the bees emerged without having been afflicted with a common parasite. MacIvor suspects this was actually because the bees built with plastic. "A potential benefit to nesting in plastic is that it (presumably) can't be punctured by numerous parasites that attack these bees," he told me. "Using pieces of plastic in a nest partially made of natural nesting materials might help with blocking parasites." Of course, another brood lost approximately 90% of its bees to toxic mold, which accumulated in the plastic straw that had been incorporated into the nest. The unbreathable plastic prevented moisture from escaping, and the larvae were poisoned. It might be impressive how successfully most of the bees in MacIvor's study managed to adapt to a polluted environment -- but it's equally disturbing to acknowledge that human waste still devastated at least one brood. "We're only just beginning to understand how waste, like plastic, infiltrate environments," MacIvor said. "Bottles float in the oceans to make plastic islands. Plastic is turning up in the guts of tiny worms at the bottom of the ocean. But finding it in use by bees -- and successfully even -- was a shock, and obviously takes this conversation in another direction." But just because the bees are using our waste, MacIvor cautioned, doesn't mean we should continue to be wasteful. "Disturbance is constant [in urban environments], so species that persist have to be able to 'roll with the punches,'" he said. "Having flexibility in nesting materials when nesting materials are the most limiting is just that. [But] what I don't want people to think after reading about these findings is that 'life goes on' and our waste will benefit another species. It doesn't!"